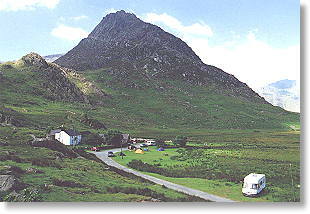 Campsite & Bunkhouse set at the foot of Tryfan, Snowdonia, North Wales. The campsite is open all year. As this is a working farm there are strictly no dogs allowed on the site. The campsite can be found easily. It is set back from the A5 between Bangor and Betws-y-Coed at the top of the Ogwen Valley. 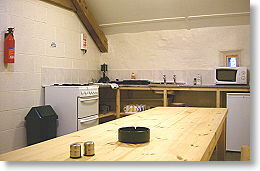 The campsite is signposted from the main road (do not confuse with the neighbouring farm of Gwern Gof Isaf). No booking is required for single and small groups of tents. 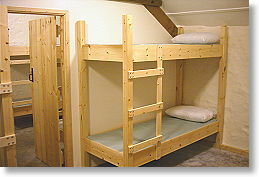 For larger camping groups (10+), or for the bunkhouse, please book ahead. Prices include showers and parking. Local meat including meat from our own farm can be bought from our butchers shop down the valley in Bethesda (Cig Ogwen). So why not take some genuine Welsh Lamb or Welsh Beef home with you! Phone 01248 601137 for more details. 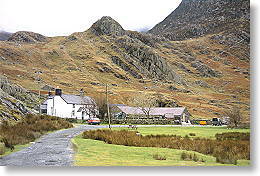 © Gwern Gof Uchaf Campsite and Bunkhouse, Capel Curig. All rights reserved.